The JagdLuther destroys armored targets up to two kilometers away. The JagdLoki easily takes down any flying enemy coming your way. The JagdWotan is one of the deadliest walkers on the planet. This reference allows you to field one of these three walkers. The JagdLuther is armed with a pair of 7.5 cm FpK 42 L/70. It’s a longer version of the old 7.5 cm gun, much more deadly and accurate. It’s even more powerful than the first “8.8” used on early Tiger tanks! 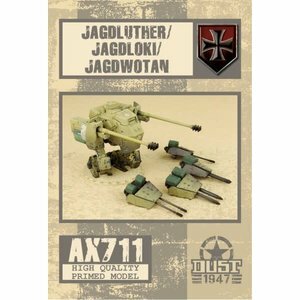 With its weapons the JagdLuther can destroy armored targets up to two kilometers away. It’s the bane of all armored vehicles. 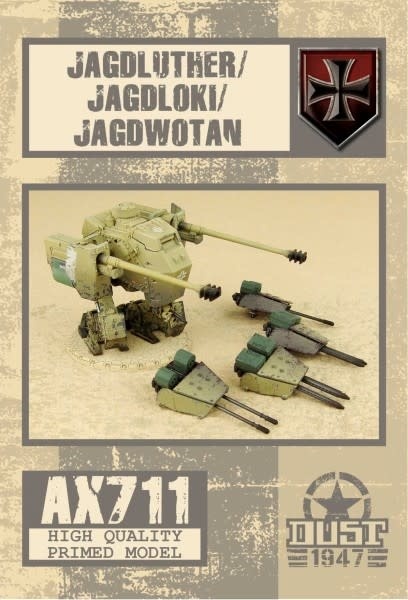 The JagdLoki is an efficient antiaircraft walker, armed with four 5cm rapid firing guns, it can easily take down any flying enemy coming your way. The JagdWotan is one of the deadliest walker on the planet. With its four laser guns, it can punch through any armor the Allies or the SSU might have, at middle range. This vehicle will surely serve the Axis for many years to come. All variants have a “belly” mounted machine gun. Although unable to target enemy aircraft, it's deadly against infantry. This reference allows you to field one of these three walkers. This item comes with three Dust 1947 Unit Cards, for the Axis Bloc. These miniatures come already pre-assembled and primed. They are ready for the battlefield, or for painting, as you wish! You can directly paint over them, since the priming serves as an undercoat and is compatible with any type of paint.